F or almost 60 years, Canadian Black Book has been the trusted and unbiased Canadian automotive industry source for vehicle values. Canadian Black Book tools and information are considered ‘The Authority’ for vehicle values not only by car dealers and manufacturers, but also the leasing, finance, insurance and wholesale sectors. For the past eight years, consumers have also benefitted from the same expert insight. In 2010, Canadian Black Book introduced their consumer website that includes free online tools for calculating a vehicle’s Trade-in Value, Future Value and the Average Asking Price. In 2018 Canadianblackbook.com, a distinctly Canadian resource for car buyers and sellers, was redesigned with a new user and mobile friendly interface with even more free consumer tools, such as the industry firsts Equity Calculator. The Canadian Black Book Best Retained Value Awards acknowledge vehicles that retain the highest percentage of their original MSRP after four years. This is extremely valuable information for the consumer, given that depreciation is the single largest expense of vehicle ownership. For 2019, the awards program analyzed model year 2015 cars and trucks in 23 categories. This year’s awards introduce three new categories – Sub-compact Luxury Crossover, Sub-compact Crossover and Batter Electric Vehicle. 2007 was the first year of the awards, 2019 marks the twelfth year of presenting them to deserving OEMs. 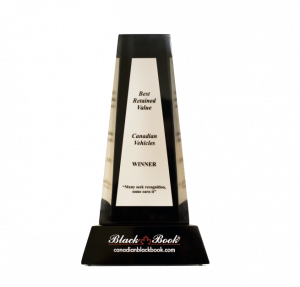 2019 is the third year Canadian Black Book awards its ‘Overall Brand’ awards, which calculates the average retained value across each OEMs product lines, in three categories – Car, Truck & Crossover/SUV and Luxury. This is the second year presenting these three telling honours.